I was prompted to write this post by a reader. A while back, Tom dropped me a line. In the course of resolving some intonation problems, he’d discovered ‘witness points’ and asked about my experience of the subject. I didn’t know. Never heard of them. So I read the link that Tom had sent. The term ‘witness points’ was a new one on me but the process it described was familiar. Turns out, this was one of those weird things — I’d been unconsciously doing this for years without ever being aware of it as an actual ‘thing’. It was something I did without thinking it could ever be used as advice to someone. I wrote a whole guide on Solving Intonation Problems and didn’t even think to mention it. D’oh! My bad. I’ve said many times that there’s a whole heap of variables that all play into good intonation. Sometimes, it’ll look like you’ve done everything right but you’ll have a string that just doesn’t make it — there’s just not enough travel on the saddle to get it to intonate properly. This is what happened Tom. After some digging, what he figured out was that strings don’t always sit nicely on the saddle and this can throw out your intonation. This definitely needs a diagram. So the string comes over the saddle in a sort of ‘arc’. Heavier strings have more resistance to ’settling’ and retain more of that arc. Essentially, they don’t conform to the shape of the saddle in the same way as a lighter string might. I believe it’s right to say that the string’s elasticity property has caused it to retain some of its previous (i.e. straight) shape. 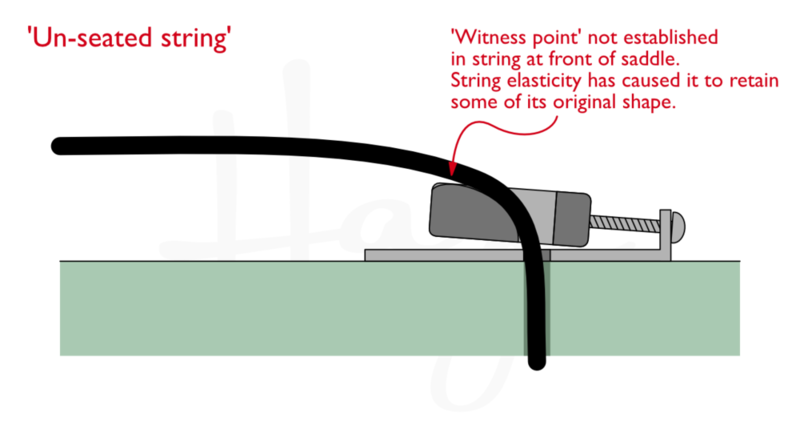 The ‘witness point’ advice is to give the string some help to conform. You give the string a bit of a nudge with your finger or thumb to better seat it and ‘shape’ it. That shape that the string takes on becomes its witness point (you’ll see its shape when you remove the string). Better seated sting — witness point established. How do you do this? Super simple. Just press at the string where it sits on the saddle. For really heavy strings, you might have to press a little off the front edge of the saddle but — very important — don’t push too hard in front of the saddle. You’re trying to seat the string and get it to conform better to the saddle. You don’t want to kink the string. Really important. A kinked string can be weakened and can do weird things. Don’t kink it. Set intonation so it’s right. Press to conform string. Check intonation again. Reset if needed. This is more of an issue for heavier, thicker strings. The lighter strings tend to conform themselves more easily. A little ‘encouragement’ can sometimes be useful if you’re trying to fix a particular problem but, overall, I wouldn’t worry about unwound strings and even the lighter wound strings. When you get into low bass-string territory, this advice can be more applicable. In an ideal world any intonation setting would start with the saddle set further back than it needs to be and the correct setting would be approached by moving the saddle forward. In this way, any bends, deformations, or squashed wraps in a string end up behind the saddle and are not part of the string’s ‘speaking length’. In practice, this isn’t always practical to do and that’s ok. Buuut, consider it where it’s possible to plan ahead. It’s not just the saddle end where this can be a problem. That’s definitely where the issue is most pronounced but strings can sometimes use a little nudge at the nut end too. Especially if you’re trying to file slot depth properly. I definitely don’t want to encourage you all to go leaning all your weight on your strings. For the most part, they’ll take care of themselves. For trying to scrape that last bit of intonation out of a heavier string, this process is great but be wary about deforming or kinking a string. For a careful setup, some gentle encouragement to seat some strings can be helpful too (set, nudge, check, reset as described above). Again, take it easy. I’ll say it once more: No kinking. Lastly, I’m not sure I care for the term ‘witness points’ as (to my mind, at least), I’m not sure it describes the process terribly well. I know what it’s describing but it doesn’t feel like a good fit for me. That said, I’m not sure I have a pithy alternative. ‘String seating’? ’Saddle-conforming’? ‘Elasticity settling’? Meh. I’m going to go with String Seating. It’s not ideal but it feels better in my head. Feel free to keep saying witness points if you like. P.S. Huge thanks to Tom for taking the time to let me know about this stuff. Very much appreciated. Cheers, Tom.